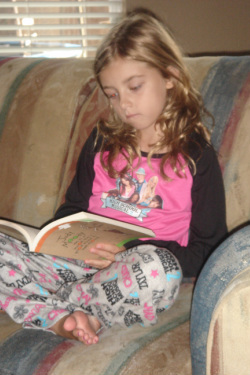 Read-a-thon in 2006, Where it all begins! Payton will read for you! Hello to all! I hope everyone is having a good summer. I am sure that many of you are thinking that this is another "We've moved letter," but it isn't! I am writing you with a special request. Many of you know that I have started making my own donations to Mary Bridge (my hospital in WA where they repaired my heart). This summer I would like to ask all of you to get involved. I am starting second grade this year and I have started reading "chapter books." So from August 1- August 27 (first day of school), I am challenging myself to read as many chapter books as I can. What I would like from each of you is a commitment to donate $5 a book that I complete to the hospital. My goal is to read 5 books. I just thought that this would be a fun summer project that would benefit more people than just me. Our donations will go to "Hall's Art for Heart Endowment Fund" started by Dr. and Mrs. Hall (my heart surgeon and his wife) to give art activities to families during their hospital stay. So any donation amount would be greatly appreciated. On August 27, I will email you or call to let you know what my final number is. Then if you would like to send a check to us, written to Mary Bridge Children's Foundation, I will make sure the hospital gets the check. And make sure your check has your current address so the hospital may send you a tax gift receipt. But so I know who would like to participate, please email me (or call) so I will have your address to send my final numbers!!! Thank you in advance for helping me build my reading skills and for giving children at the hospital an activity to pass their time! Oh, I can't believe that I almost forgot, I am doing great (no changes in meds or in my heart over the last 6 months)!!! And Samantha is doing great as well- she is almost as big as I am! Hello everyone! 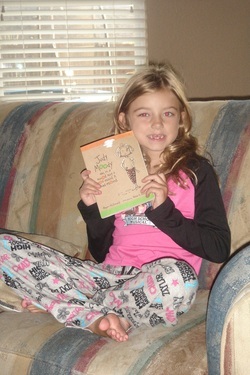 Thank you all for responding and for being a part of Payton's "read-a-thon." 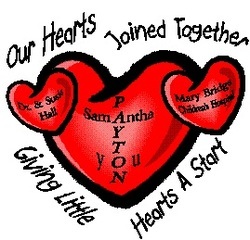 Many of you have already sent your donations to us stating your confidence in Payton's ability to complete her goal, but we wanted to go ahead and email everyone letting them know how the reading went. Since this was our first year trying this, we had a few issues that we had to work through. First, Payton typically reads to Samantha at night and since Samantha prefers shorter books, this factored into our progress. Second, Daddy did not like one of the series she was reading and he made her stop and choose another book after she had read approximately half. So, she read many books this summer and five that we are calling "chapter books" (these were lengthy and several focused on boosting her self-esteem in reading). She put together a list with favorite parts (see below). And you know Payton, she is already planning for next summer. Next summer we are going to count pages, not books (she wanted to count all of the books she read to Samantha!) So, thank you for supporting her this year and please email us to let us know if it is okay to ask again next year. Thank you for your support! Remember, please send your checks to us, but write them to Mary Bridge Children's Foundation and they will send you a tax receipt. Please let us know if you do not receive one. "When her brother found a moon rock and he crashed it and sold the moon dust." "When they went sledding and Frog fell off by Toad did not know. Then when Toad realized Frog was off, he crashed." "When Toad thought Frog didn't want to be friends so Toad fell off a turtle. Then they had to eat soggy sandwiches. And Frog did want to be friends." "When the dolphins were helping children with special needs." "When she had just gotten glasses and she shows them to the class. A friend comes up and tries them on." Payton read these books in there entirety- some to herself, some aloud to her sister, Samantha and some with mom and dad reading with her!